Cub Scouts should wear their uniforms with pride. "Class A" is the full dress uniform. For Tigers, Wolves and Bears, this includes a blue cub scout shirt, blue pants, belt, and hat appropriate to their rank. Lions may wear the Lion t-shirt, but can optionally wear the blue cub scout shirt. Webelos and Arrow Of Light (AOL) ranks wear the tan scout shirt, belt and olive green pants. All these things can be found at our local scout store in Newhall. The pack provides your neckerchief and slide. "Class B" is the Pack 58 t-shirt, which can be purchased directly from the pack. Upon joining the pack, your scout will need both uniforms. For den and pack meetings, boys should be in Class A. Other events may specify to wear Class A or Class B as appropriate. The placement of various patches and awards can get confusing, so here is a breakdown of items your son may receive as he advances and what to do with them! The pack numerals (red numbers 5 and 8), the den number (assigned when you join - check our Leadership page for current den numbers), our council (WLACC) shoulder patch, and the world scouting crest (purple circle - centered a couple of inches above left pocket) need to be purchased and attached to every new uniform as shown on the right. 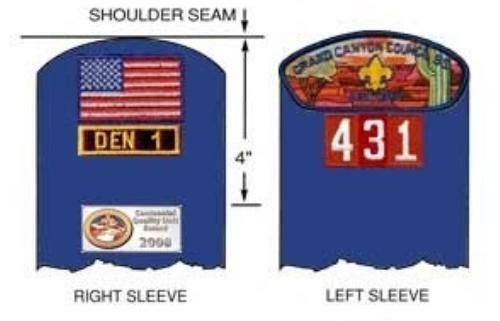 Note that Webelos/AOL dens may replace the den number with a round patrol patch - check with your den leader! Additionally, you may receive a red "Unit Excellence" patch (shown in white in the image of the right sleeve here) - it goes near the edge of the right sleeve. Cub Scouts earn belt loops as they complete adventures. These are worn on the blue belt. Hint: squeeze the metal flaps inward after sliding them onto the belt to help keep them from falling off when the belt is removed! Diamond-shaped rank patches will be sewn onto the left pocket as shown on the right. Each patch has its position in the diamond and should not be moved, e.g. if a boy joins as a Wolf and never earned the Tiger rank, no patch will go in the bottom of the diamond. Boys cannot go back and earn old rank patches. 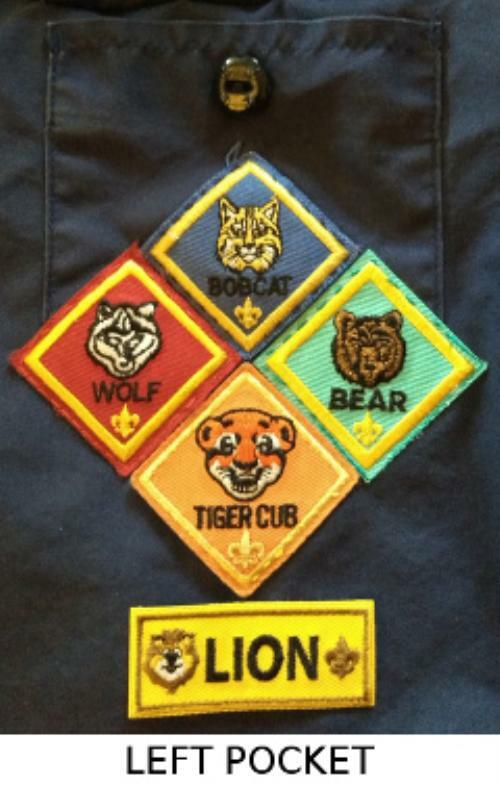 The rectangle-shaped Lion patch is sewn approximately 1.5 inches under the left pocket on the blue cub shirt (to allow space for the future diamond rank patches, which will extend past the bottom of the pocket; measure about 5 inches below the button). 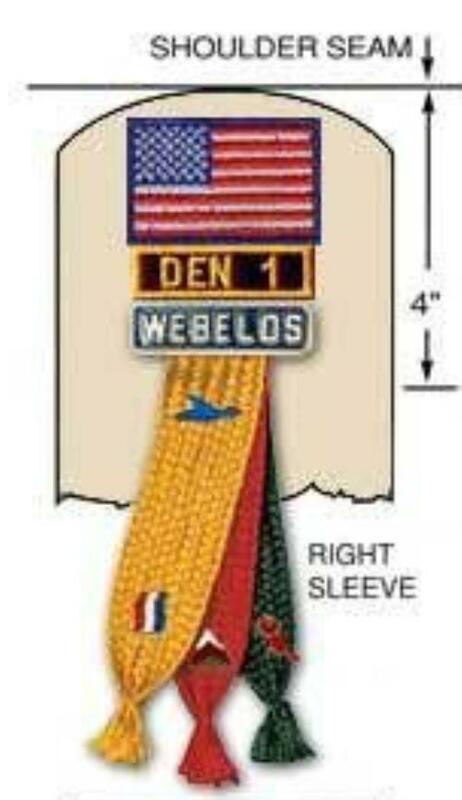 On the tan Webelos shirt, a boy may choose to wear the diamond (in this case, the Tiger patch would be replaced with a diamond-shaped Webelos patch), but these are being phased out and most will wear the oval-shaped Webelos patch alone on the left pocket. The rectangle-shaped Arrow of Light patch is sewn under the left pocket on the tan shirt and can remain there when the scout transitions to Boy Scouts. When a boy ranks up, he will also receive a rank pin. This pin does not go on his uniform - it is for his adult partner to wear! Some parents make or buy "brag ribbons" on which to wear these pins. If a boy earns an award pin for a derby or a summertime pin, these may be worn on the flap of the right pocket. Religious award pins may be worn on the flap of the left pocket. Boys will earn patches for attending certain events. These patches do not go on his uniform, but may be attached to a "brag" vest or jacket, or displayed in some other manner of your choosing. While not used often in cub scouts, some awards, such as religious awards, are shown with a small rectangular "knot" patch. These are worn just above the left pocket (not shown). Please see the uniform inspection sheets attached below for more details.